David Kahn and Kyle Youmans will broadcast all 140 games of Power baseball, live on "The Jock", in 2019. CHARLESTON, W.Va. (January 31, 2019) - The West Virginia Power, the Low-A South Atlantic League affiliate of the Seattle Mariners, is excited to unveil its broadcast team and radio affiliate group for the 2019 season. Kyle Youmans (KYL YOH-menz) has been hired to join the Power's broadcast team in 2019, partnering with lead broadcaster David Kahn for all 140 games of Power baseball, which will once again air on "The Jock" WJYP 1300 and WMON 1340 AM. "The Jock" will remain the Power's flagship station for the third straight year, with signals originating out of both St. Albans and Montgomery. The broadcasts are also streamed on the Power's website, wvpower.com, and on the MiLB First Pitch App. Additionally, LM Communications has joined on as a presenting sponsor of the 2019 South Atlantic League All-Star Game, which will air live on "The Jock" 1300 and 1340 AM. As part of the agreement, LM Communications radio personalities will broadcast live from the ballpark leading up to the game on June 18, hosting their Jock Talk program and coordinating live interviews with players and coaches on Rock 105 WKLC from 5-7 p.m.
"LM Communications is pleased to have extended our partnership agreement through 2019 and the All Star Season," said Dotsy Klei, VP of Community Relations for LM Communications. "We are excited to continue airing Power baseball games on 1300 and 1340 "The Jock", and all of our radio stations, including Rock 105 and 100.9 The Mix, are committed to supporting the West Virginia Power in the coming season." 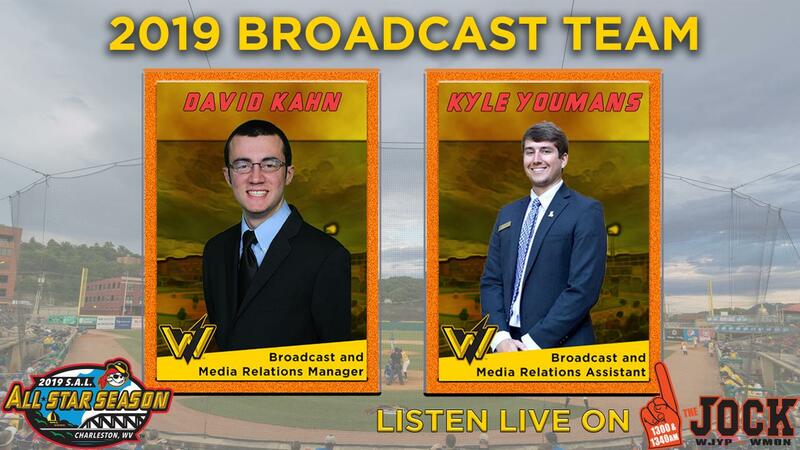 Youmans will serve as the Power's Broadcast and Media Relations Assistant in 2019, handling play-by-play and color commentary alongside Kahn for all 70 home games and select road contests. In addition to his broadcast duties, Youmans will be the team's secondary media relations contact, contributing written content through feature stories, game recaps and press releases to the Power's website, blog and Gameday Program. "I could not be more excited about joining the West Virginia Power for my first season of affiliated baseball," Youmans said. "In my career, I have been surrounded by some of the best young talent in the broadcasting business, and I cannot wait to continue that trend alongside David for the entirety of the 2019 season. This opportunity is a whole new adventure that is a long way from my home in Texas, but I cannot wait to get back to the ballpark so we can make this baseball season the best ever seen (or heard) in West Virginia." Youmans is a 2018 graduate of the University of North Texas with a Bachelor's Degree in Converged Broadcast Media. The Waco, Texas, native got his start broadcasting baseball in the Texas Collegiate Summer League in 2017, when he was the voice of the Brazos Valley Bombers. Youmans has been heavily involved in the state of Texas for quite some time, serving as a show host and producer for ESPN Central Texas as well as the voice of Texas lacrosse and a race announcer at Texas Motor Speedway. The North Texas alumnus is an avid fan of all Mean Green athletics, the Texas Rangers, Dallas Mavericks, Dallas Stars and Dallas Cowboys. Youmans does have a connection to the Power in fact, as he got former Power prospect Josh Bell to pop out in a high school game. Besides baseball, Youmans enjoys fly fishing, camping, golfing and watching Netflix. "I am thrilled to have Kyle join me in the broadcast booth this season," Kahn said. "Power fans are going to thoroughly enjoy listening to Kyle all season long, as well as reading the coverage he will provide on a daily basis. Kyle is one of the burgeoning young stars in broadcasting, and he will be a truly valuable asset to myself and the rest of the organization this year." The 2019 season kicks off April 4, 2019, and the South Atlantic League All-Star Game is set for Tuesday, June 18, 2019, with a 7:35 p.m. first pitch. Full season and mini-plan packages are available now by calling 304-344-BATS or visiting wvpower.com.